Does your system lag or does it seem to have any unusual behavior, if it does there is a high chance of malware infection on your computer. If it is ransomware, then your computer and files may get encrypted with strong encryption. Here are some tips to get ransomware off your computer. Ransomware is a type of malware which locks or encrypts the victim's computer and demands payment for decrypting the computer. The primary motive for all ransomware attacks is always monetary. Unlike many other types of cyber attacks, ransomware attacks notify the victim about the exploit, and it also gives instructions on how to recover from it (usually it demands payment for recovery). To avoid a crackdown by law enforcement, hackers who are behind the ransomware attacks typically demand payments in virtual currencies, such as the Bitcoins. Ransomware is a serious threat to your computer and files. It might encrypt your computer and delete data backups on your computer. It can quickly spread to other computers in your network. Ransomware usually comes disguised as email attachments of seemingly benign funny images, greeting cards, or audio and video files. Once the ransomware gets executed on a computer, it can change the victim's login credentials, encrypt files and folders on the victim's device, as well as on other connected devices. In the first case scenario (changing the login credentials), ransomware shows a full-screen image or notification on the infected system's screen, which cannot be closed at the user's will. It may also have the instructions on how users can pay for the ransom and get the decryption key. In the second case scenario (encrypting files and folders), the ransomware prevents access to valuable files like documents and spreadsheets. If you notice any of those signs, there is a high chance of ransomware infection on your computer. How Do I Get Ransomware Off My Computer? Since there are multiple variants of ransomware in existence, it is difficult to precisely pinpoint the specific type of ransomware that has infected your computer. If your computer gets infected by the ransomware, make sure to follow these guidelines to remove it safely. Once you are aware of the ransomware infection on your system, make sure to disconnect the internet connection to your computer. Since many ransomware variants tend to communicate with its creators (cybercriminals) to initiate the encryption process, disconnecting the internet connection will prevent ransomware from communicating back to its creators- eventually, stopping it from encrypting your computer and files. Next step is to use your computer in Safe Mode. Boot your computer in 'Safe Mode with Networking.' You can do it by pressing 'F8' key when your system boots. Install Comodo antivirus on your computer and perform a full scan- it will remove or contain the ransomware using its powerful containment engine, preventing further damage to your computer and other connected devices. How To Protect Your Computer From Future Ransomware Attacks? Make sure to download files and other software only from reputable websites. Install a good firewall program like Comodo Firewall to detect and prevent malicious activities on your network. Do not open links, suspicious emails or attachments from unknown senders. Most important of all, make sure to download and install a good antivirus program like Comodo Antivirus. 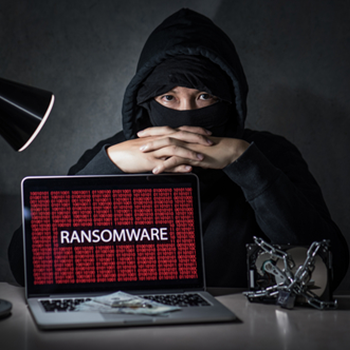 For businesses, finding and removing ransomware is not easy. There may be multiple legacy endpoints/devices deployed at different locations. Due to that, conventional antivirus products are not a viable option. Comodo Advanced Endpoint Protection (AEP) is an ideal solution for such scenarios as it offers complete protection across devices and OS platforms. For more details about Comodo Advanced Endpoint Protection, contact us at EnterpriseSolutions@comodo.com or +1 888-256-2608.